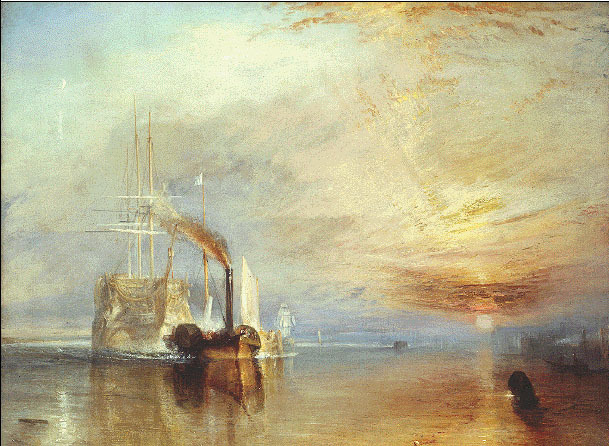 J. M. W. Turner, The Fighting Temeraire tugged to her last Berth to be Broken up, 1838. Before 1839. Oil on Canvas. 90.8 x 121.9 cm. National Gallery, London. [Number 524, Turner Bequest, 1856]. Compare a photograph of a similar scene from the last decade of the nineteenth century. Landow, George. [Ruskin's discussion of the painting] The Aesthetic and Critical Theories of John Ruskin. Princeton: Princeton University Press, 1971.